NYANZA, NS – Big Spruce Brewing has announced that the 2018 edition of an annual favourite is coming out this weekend in a range of new variants for fans to enjoy. 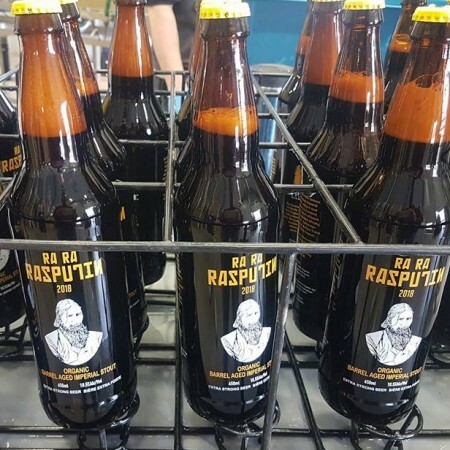 Ra Ra Rasputin Imperial Stout has traditionally been aged in Whiskey barrels from Cape Breton’s Glenora Distillery, and that version will once again be available. But as reported by Atlantic Canada Beer News, it will be joined by four other versions this year, respectively aged in barrels that previously held French Cognac, California Cabernet Sauvignon, American Bourbon, and Nicaraguan Rum. All five expressions of Ra Ra Rasputin 2018 will be released at the brewery on Saturday April 28th, and launch events will also be held Bishop’s Cellar in Halifax on Saturday from 3:00 to 5:00 PM, and Battery Park in Dartmouth on Sunday at 5:00 PM.